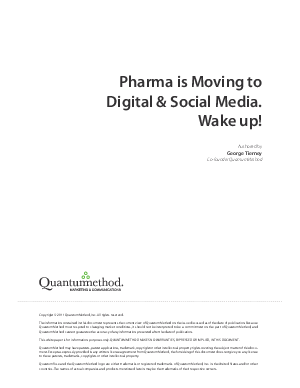 Resource Centre > Research Gateway > QuantumMethod > Pharma is Moving to Digital & Social Media. Wake up! It's happening right now, all around us. Some of it is under the radar, some of it right out in the open. In spite of the cries for FDA guidance, which seems like it will never come, or fears of being the first to jump off the proverbial cliff, big Pharma is slowly making the move that mainstream consumer brands took years ago. The likes of Lilly, Pfizer, J&J, and Sanofi-Aventis are moving more and more marketing dollars to digital media and away from traditional DTC. There are many factors moving brand managers in this direction. These forces have been pushing and shoving at them for years now, and in many cases it comes down to simple physics - you simply cannot resist market forces forever, something has to give. Consumers are on a mass move from traditional media consumption to multi-platform digital and social media - or what some will simply call "new media."